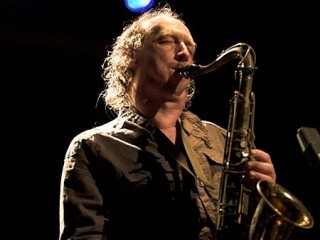 Ellery Eskelin (born August 16, 1959) American tenor saxophonist. He has been identified as the best talent in jazz music today by critics for the New York Times andthe Village Voice, as well as other major jazz publications in the United States and Europe. While his roots are in traditional jazz, Eskelin shatters the structure that his predecessors relied upon to develop their sound. But unlike the free jazz movement of the 1960s, which attempted to throw out the past and create a new jazz, Eskelin does not deny his past. He uses the catalog of jazz musicians he has studied with over the years in an original expression of sound that is ever changing. In 2011 Eskelin formed his latest ensemble, "Trio New York", with Hammond B3 organist Gary Versace and drummer Gerald Cleaver. A renewed interest in early techniques of sound production on the saxophone (sparked by his switch to a vintage instrument) has invigorated Eskelin's musical aesthetic. This group incorporates standard material from the Great American Songbook but in a freely improvised setting. In comparing the group's eponymous recording to an earlier project by Eskelin devoted to the music of saxophonist Gene Ammons ("The Sun Died", 1996), reviewer Ed Hazel wrote "If anything, Trio New York is both subtler and more adventurous, more at home with the music and less self conscious about taking liberties with it." -Setting The Standard , Enja,1988. -Forms , Open Minds, 1990. -Figure of Speech , Soul Note, 1993. -Jazz Trash , Songlines, 1995. -One Great Day , hatOLOGY, 1996. -Kulak 29 & 30 , hatOLOGY, 1997. -Five Other Pieces , hatOLOGY, 1998. -The Secret Museum , hatOLOGY, 2000. View the full website biography of Ellery Eskelin.